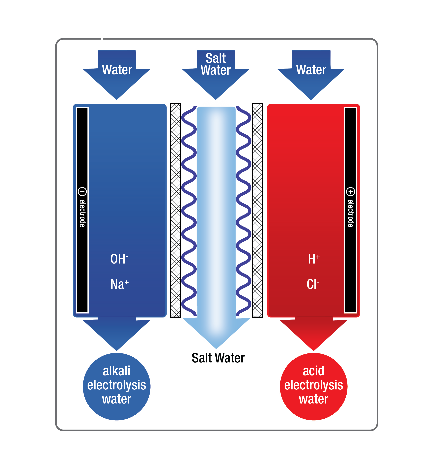 Ordinary tap water containing a low concentration of sodium chloride (NaCl) is passed through an electrolysis chamber containing an anode (positive electrode) and cathode (negative electrode) that is separated by a unidirectional, permeable diaphragm. Positive ions (cations) are drawn towards the cathode where they receive electrons from the electron-rich cathode to form sodium hydroxide (NaOH), a cleaning fluid with the ability to reduce bacteria and pathogens. At the anode, negative ions (anions) are attracted and surrender their additional electrons to the electron-depleted anode to produce hypochlorous acid (HOCL), a powerful disinfecting fluid which has superior germicidal, biocidal and sporicidal properties that can eliminate pathogens such as Methicillin-resistant Staphylococcus aureaus (MRSA), Vancomycin-resistant Enterococci (VRE), Human Immunodeficiency Virus Type 1 (HIV-1), and more. The above equations are not a complete list, but give examples of some of the reactions that take place. 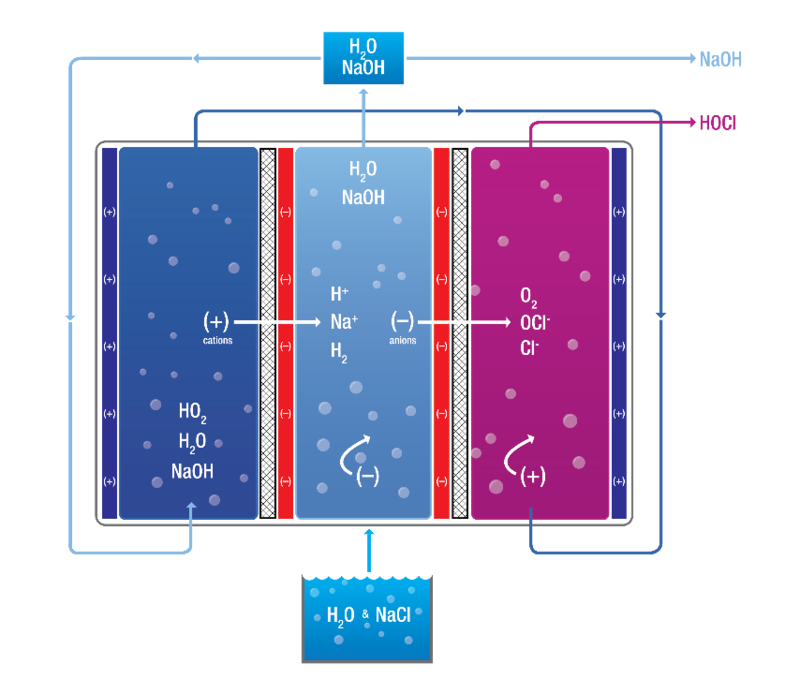 Notably, they show that electrolysis of water produces H+ and OH ions, H and OH radicals, H2, O2, HO2, O3 and the like due to redox reactions. 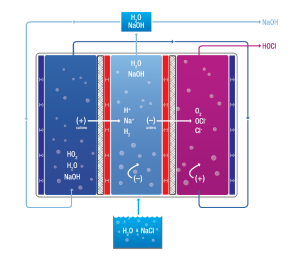 As a direct result of electrolysis, hydrogen and ozone gas are released and a percentage of hydroxides which remain in the solution in various forms including but not limited to hydrogen peroxide. 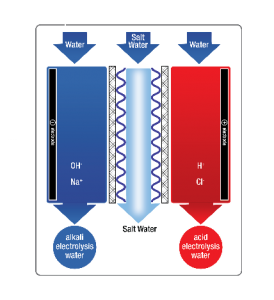 AQUAOX generated HOCL is pH neutral, super-oxidized water generated by electrolysis of a dilute salt solution passing through an electrolytic cell. This process creates large volumes of a gentle but extremely potent antimicrobial solution capable of rapid reduction of bacteria, viruses, spores, cysts, scale and biofilm. HOCL is stable, cost-effective to produce, greener than traditional chemical technologies and can be used in multiple applications across a wide variety of industries. HOCL is an oxidizing agent due to a mixture of free radicals, giving it an antimicrobial effect. Studies have shown that HOCL is highly biocidal and can substantially reduce pathogens such as Salmonella and E. coli without the use of costly toxic chemicals. In addition, it offers the added benefits of being able to remove biofilm and scale from manufacturing equipment, thus, greatly minimizing a major contributor to contamination problems. Because HOCL effectively destroys microorganisms, they cannot build up resistance to HOCL as they can to other sanitizers and disinfectants. Standard toxic chemicals can create strains of pathogens that become resistant over time because the cell can expel or neutralize the chemical before it can kill it, thereby causing the overall efficacy of chemical cleaners and disinfectants to be significantly reduced. Effect of pH on the ratio of free available chlorine. HOCL has a higher biocidal activity than NaOCL and the disinfecting effect is 80 to 300 times higher than the activity of NaOCL with the same free available chlorine concentration. This greater effect is due to the continual production of free available chlorine through electrolysis without hyperchloration. The free available chlorine is maintained in OCL- ion and is gradually converted into the active form HOCL by the electrical energy. The rate of dissociation of HOCl is so rapid that equilibrium between HOCl and the OCl- ion is maintained even though the HOCl is being continuously used. For example, if water containing one ppm of titratable free available chlorine residual was introduced into it a reducing agent that consumes 50 percent of the hypochlorous acid, the remaining residual will redistribute itself between HOCl and OCl- ion. A common myth is that when HOCl is used to disinfect water only OCl– remains. In reality, when HOCl is used, OCl– immediately converts back to HOCl to maintain the percentage division mandated by the pH.